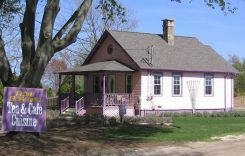 Tea Time Cottage has evolved into an online shop only. The following review was written in April, 2006 and will remain here for historical purposes. Use link at the end of this review to visit their store. 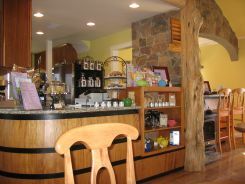 Tea Time Cottage offers a large selection of fresh brewed, loose leaf teas along with wraps, soups, sandwiches, pastries, scones and other delights. Prices are reasonable, the service is excellent, and the atmosphere is soothing. All teas are available hot or iced. While coffee is not on the menu Mate, a South American herb that tastes like coffee, is. Although Long Island is widely known for its namesake drink the Long Island Ice Tea, hot tea and teahouses generally don’t come to mind. That coupled with the fact that tea is not exactly, well, my cup of tea, probably explains my bewilderment with Tea Time Cottage, the little lavender building on Sound Avenue (Rt. 48) in Jamesport. I’ve passed it many times and always wondered what the heck it is. The sign out front, “Now Serving Tea & Café Cuisine” didn’t help much. Today, as I was passing it once again I decided to stop in and check it out. Actually, the decision was quite spontaneous. I had already passed the placed, then in a moment of curious frustration, turned the car around and went back. Two engaging women welcomed me in and explained that Tea Time Cottage is a teahouse, which is just like a coffee shop, but tea is served instead (Eureka! Now I get it.) and women are usually more familiar with the concept than men. Quite true. If it were Fat Bob’s Fried Food, Beer & Machine Shop I’d know exactly what the place was about and would have been there as soon as the sign went up. But it was late in the day and I was tired and hungry. Despite my preference for coffee I was sufficiently intrigued and decided to settle in for a cup of tea and a snack. 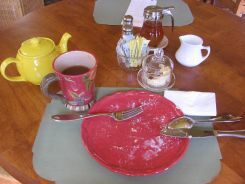 The tea was placed in a two cup ceramic teapot and allowed to steep for exactly three minutes (they used an electronic timer). Brew time varies with variety and some have to steep for as long as ten minutes. Then I started to notice the interior. It was cozy, yet I didn’t feel like I was in someone’s living room, and very bright. I took advantage of the light to eyeball the floors, counters and kitchen area, which were all spotless. There was some nice background music playing at just the right level that really set the mood. Lucky for me it was well after lunchtime, so I had the place to myself. 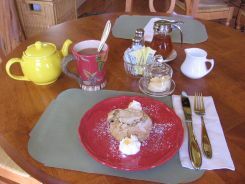 I enjoyed my tea and tasty scone at a nicely set table, watched springtime in full bloom through a window, and chatted leisurely with the staff. It was a really great way to end my busy day. I'm not sure teahouses will ever be the most popular destination on Long Island, but Tea Time Cottage is definitely on my list of places to visit again. Like your tea with a kick? Try a Long Island Ice Tea.